Dr. Dan graduated from Oregon State University in 2001. Shortly after graduation he married Jennifer Matthiesen who is also a veterinarian. They live on a small farm in Dundee and have been blessed with twin girls and a boy who do their best to keep things lively. Sheep, chickens, Katie the amazing Border Collie, Millie the Cavalier King Charles Spaniel, Lukie the Labrador, Skippy John and Madeline the barn cats and the queen of the house Fancy Pants round out Dan’s four legged family members. Dr. Dan enjoys challenging dermatology, medical and surgical cases. Dr. Jennifer Matthiesen is an Oregon native who graduated from Oregon State University College of Veterinary Medicine in 2001. She practices small animal medicine and enjoys working with dogs, cats, and a variety of pocket pets. Her special interests include Dermatology and Feline Internal Medicine. In her spare time, Dr. Jen is a devoted mommy to twin girls and a little boy. Her four legged family members include Millie (Cavalier King Charles Spaniel), Lukie (Labrador Retriever), Fancy Pants (old lady kitty), Katie (Border Collie), and Slide (Appaloosa Mare). When not running between work, soccer practices, and school activities, Dr. Jen gardens, reads, and occasionally gets to ride Slide. And as an aside, Dr. Jen is married to Dr. Dan! Dr. Randy graduated from Washington State University in 1973. After graduation he went to work for a large mixed practice in Snohomish, Washington until he decided to relocate and settle in Newberg, Oregon in 1975. Dr. Randy was a teacher in the Portland Community College Veterinary Technology Program for 4 years. He very much enjoys working with young people who show a strong interest in animals. Dr. Randy truly enjoys all animals, and has owned a wide variety of large and small animals during his career. Currently he is the proud owner of a purr-snickety calico cat named Hallie and he is also adored by our office cat CeCe (especially at lunch time). Dr. Randy is proud to work alongside his son, Dr. Dan, and the clinic thrives as a close-knit family environment because of this. Dr. Randy is also incredibly proud of his daughter Nikole who is a teacher, and of his beautiful grandchildren whom he adores. Dr. Jennifer knew as a young girl that she wanted to be a veterinarian. Even at 13 years old she was already job shadowing at a local veterinary clinic. Later she became a kennel assistant and then a veterinary assistant at that clinic. It was then that she met Dr. Randy, who was instrumental in helping her to obtain her Veterinary degree. 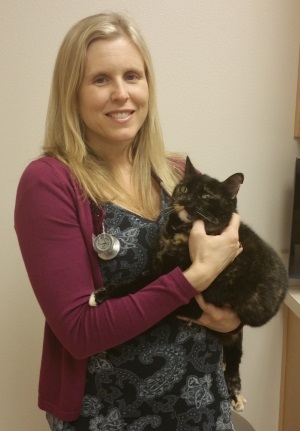 Upon graduating from Oregon State University in 2006 Dr Jennifer went to work for a variety of veterinary practices before settling here at Family Pet Clinic in 2012. Her addition to our team has been almost seamless, folding into our close-knit family environment here with ease. Dr. Jennifer enjoys the rural lifestyle of Yamhill County where she gardens, cooks, rides horses and loves spending time with her husband and daughters. Dr. Katie Ellis is a Florida native who received both her Bachelors of Science in 2001 and her Doctor of Veterinary Medicine degree in 2007 from the University of Florida. Dr. Katie has a passion for travel and after visiting Mt Hood for a winter in college, knew she wanted to make Oregon her home. She completed an equine surgical internship in Ocala Florida before making her way to Newberg in 2008. Since then she has worked predominately with dogs and cats. She is so excited to start working in the community she has come to love over the past 7 years. She brings to the practice extensive knowledge and experience in medicine, surgery, dermatology and dentistry. Over the last few years she has developed advanced skills in diagnostic ultrasound of both the abdomen and heart and has become certified in veterinary acupuncture. When she is not working, she enjoys time at the coast or snowboarding with her husband and daughter. She can also be found visiting her favorite local wineries and enjoying walks with her dog Lacey and cuddles with her cat Gypsy.